For the moment, all the procedures that we have created are of the Public type, which means that they are accessible from any module. 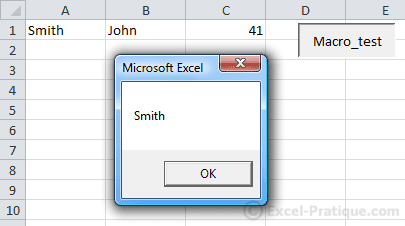 To execute a procedure from within another procedure, simply enter its name. warning ' <= execute the procedure "warning"
Here, when "macro_test" is executed and when A1 has the value "", the "warning" procedure will be executed. Arguments make it possible to use values from a procedure in a sub procedure (remember that by default, variables are only accessible from the procedure in which they are declared). MsgBox "Caution: " & var_text & " !" When there are multiple arguments, these should be separated by commas. By default, if a procedure has arguments, these are mandatory, and if they are not included, the procedure will not execute. Arguments must be entered in the correct order. To test whether an optional argument is present, we will use the IsMissing function. This function is only compatible with certain types of functions (thus Variant), and this is crucial because the type of the optional arguments has not been specified in the declaration (a non declared type is = Variant). MsgBox last_name & ", " & age & " years old"
By default, arguments are of the ByRef type, which means that if a variable is submitted as an argument, its reference will be transmitted. In other words, if the variable is modified in the sub procedure, it will also be modified in the procedure that called the sub procedure. A second method is to use ByVal. Unlike ByRef, which transmits the reference (shortcut), ByVal transmits the value, which means that the value submitted as an argument will not be modified. The main difference between Sub and Function is the value returned by the function. 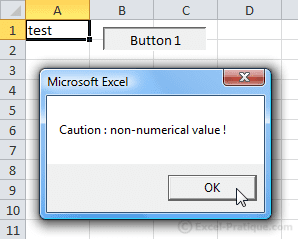 square = var_number ^ 2 'The function "square" returns the value of "square"
Functions can be used on a worksheet like any other Excel function.